Analysis: Obama Finally Finds Reset Button, But Is It Too Late? : It's All Politics The president knows he was once regarded as having limitless promise, and realizes as well how disappointed many of his acolytes have been. Obama Finds Reset Button With 2 Years To Go: Is It Too Late? 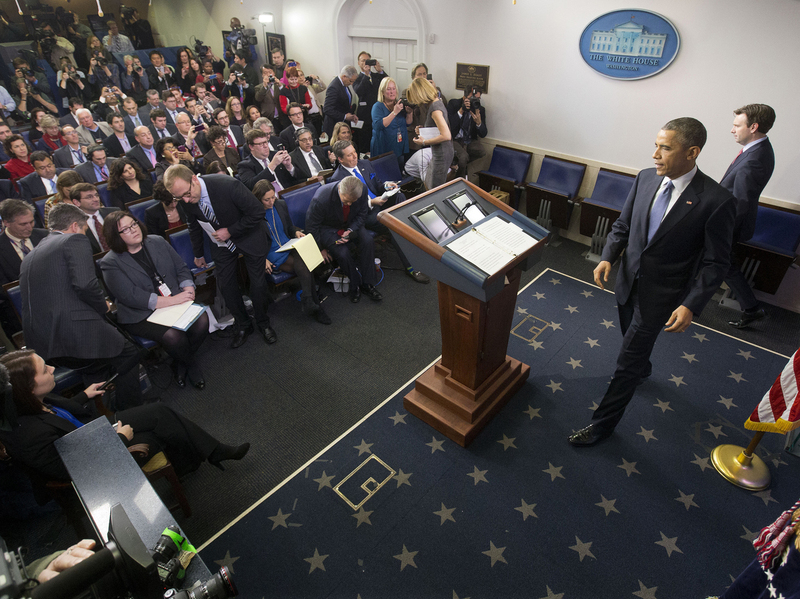 President Obama arrives for a news conference Dec. 19 in the Brady Press Briefing Room of the White House in Washington. As he looks toward his seventh year in the White House, President Obama still believes there is time to make his presidency a transformational moment in history. In an interview recorded shortly before he left for Christmas vacation in Hawaii, the president told NPR's Steve Inskeep that 2014 had been "a bumpy ride" but also the "breakthrough year" he himself had predicted. "At the end of 2014 I could look back and say we are as well-positioned today as we have been in quite some time economically, that American leadership is more needed around the world than ever before," Obama said. Inskeep began the interview noting Obama's recent flurry of moves, including the deferral of deportation for up to 5 million immigrants in the country illegally and the even more stunning diplomatic opening to Cuba. Inskeep asked if the president had done these things now because he no longer has to worry about the political backlash punishing his party. Obama initially said no, he did not see the election as liberating. He added that both the immigration and Cuba moves had been incubating for some time. "But this was the moment when you could do those things?" Inskeep interjected. "Yeah," Obama responded. "Here's what I think is true. I have spent six years now in this office. We have dealt with the worst economic and financial crisis since the Great Depression. We have dealt with international turmoil that we haven't seen in a lot of years. ... And that is liberating in the sense that a lot of the work that we've done is now beginning to bear fruit." Asked Inskeep: "Can I think of you as shifting from things you had to do to things you more want to do?" To which Obama replied: "I think that's fair." He also said he thought the concentration on immediate crises up to now "gives me an opportunity then to start focusing on some of the other hard challenges that I didn't always have the time or the opportunity to get to earlier in my presidency." 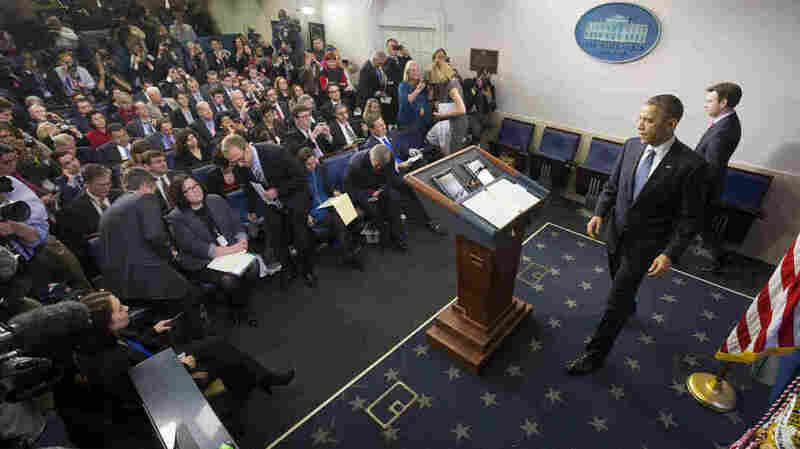 Obama often has seemed oblivious to media reviews of his performance. But he shows more concern about the historical record and the unavoidable burden of legacy. He knows he once was regarded as having limitless promise, and realizes as well how disappointed many of his acolytes have been. The Obama of hope and change was honored with a Nobel Peace Prize in his first year in office. Today, with the U.S. still staggering toward disengagement in Afghanistan and re-ensnared in Iraq, the idea of Obama as a peacemaker is strained at best. And that is to say nothing of the relentless drone attacks and sustained domestic surveillance that show how willing to be warlike this peacemaker has been. The president who promised health care for all has been mired in the politics and administrative nightmares of that issue. His recent moves on climate change and immigration have come after years of bitter disillusionment for the advocates of both. But in his interview with NPR, Obama laid out an alternative vision of his time in office. He recalled the financial crisis of 2008-2009 and the job losses that followed, noting how the rescue of the auto industry had led to a rebound in U.S. manufacturing. He recited the job growth and wage improvements and other economic measures of recovery, including cutting the annual federal budget deficit by two-thirds from its peaks of 2010-2011. And that, the president said, was the empowerment for this final two years. "Now I have the ability to focus on some long-term projects," Obama said, "including making sure that everybody is benefiting from this growth and not just some." The president also talked about spending a trillion dollars improving schools and scientific research, and another trillion on crumbling roads and bridges — the infrastructure inheritance that needs renewing. He also spoke of rebuilding relationships in the tumultuous parts of the world where the longtime U.S. role has been diminished. Speaking of Cuba, at one point the president said he wanted to continue to pursue such initiatives "because frankly it's easier for a president to do at the end of his term than a new president coming in." And that has been a pattern for other two-term presidents in the past. Hard as it may be to believe, President Clinton had a strong finish to his presidency, even though he began his final two years in office battling impeachment. After his acquittal by the Senate in 1999, Clinton presided over two years of roaring economic growth and negotiated a series of historic budget agreements with a hostile Congress under total Republican control. Ronald Reagan also began his final two years in office on an ebb tide, losing control of the Senate in the 1986 midterm election, much like what Obama just endured. The year 1987 was dominated by a congressional probe of the arms-for-hostages deal Reagan's administration had struck with Iran, and by the Senate's rejection of Reagan's next appointment to the Supreme Court (Robert Bork). Yet Reagan emerged from those setbacks in remarkably strong fashion. A rapprochement with Russian leader Mikhail Gorbachev led to a deal on strategic weapons that ended 40 years of nuclear standoff, and in essence marked the end of the Cold War. Inflation remained under control even as the economy continued to recover from the recession of the early 1980s, and Reagan left office with his popularity restored. Reagan even was able to bequeath his office to his vice president, the first president to finish his term and pass the baton directly to an elected successor of his own party since 1928. No Democratic president has enjoyed this rare form of voter approval since the Civil War. And the prospect of breaking that drought could be a final goal for the fourth quarter of the current, history-making presidency.